In finishing The Wine of Solitude, I have read all the Nemirovsky in my collection. I can't overstate how much pleasure this writer gives me. In this, her most autobiographical book, she evokes the Kiev of her childhood, which she hated, but which with its air full of summer dust and the scent of lime trees sounds lovely to me. She convincingly recreates a childhood that leaves her unable to trust or to form attachments, and her choice of the high road at the end of the book feels well-earned. I want to read Nemirovsky but don't know where to start. 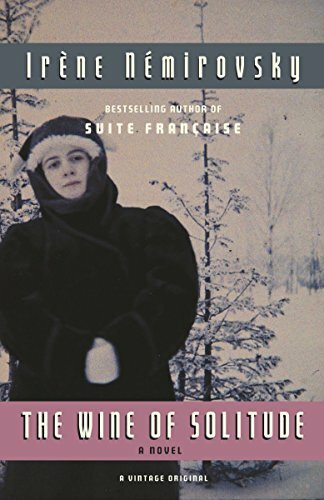 David Golder, Suite Française or first read The Life of Irene Nemirovsky (O. Philipponnat and E. Cameron). What would you suggest? Hmm. The biography was fascinating, but it's very long, and if you want to get right into her writing, you could start with The Wine of Solitude. It matches the first half of her own life pretty closely, and gives you a taste of her style, her ability to evoke setting, and her spot-on observation of characters. David Golder describes the type of life she led after her family's emigration to France, and the title character is said to be based on her father. I found it tremendously moving. The Dogs and the Wolves is also set in that time and is about Russian Jewish emigres to France. I guess if I was going to read them all again, I'd do it like that, chronologically, and maybe be working through the biography at the same time; it describes in detail her writing process for each book, and what was going on in her life at the same time. And it has lots of wonderful photographs. I even got it out again to look at the pictures while I was reading Wine of Solitude. Wonderful....I'll order The Wine of Solitude right now! It's been a great read-blog connection in 2012 2013....with you. Let's see what we can read in 2014 and share our thoughts! Started Le Vin de Solitude this morning. I read a description about her mother. "..ces mains blanches et oisives aux ongles taillés en forme de griffes..."
( hands, white and idle with nails shaped like claws.. pg 14..) I love the book already! By all accounts she gives an accurate characterization of her mother in this (and other) books. That woman was something else.